The city manages over 22,000 public trees in our urban forest. The strength of Davenport's urban forestry program is reflected in the city's designation as a Tree City USA by the Arbor Day Foundation. The city has been recognized as a Tree City USA each consecutive year since 1980. The public is responsible to maintain trees on private property. Plants trees in the city right-of-way. The health of our urban forest is improved by selecting and planting diversified species. Removes public trees that have been identified as hazards or undesirable. These trees are structurally unsound due to: disease, storm damage, old age, or death. Responds to emergency requests to address trees laying in the street and/or city right-of-way. To report a tree that presents a hazard call 563.326.7923 24/7. How can I dispose of tree branches that have fallen on my property as a result of storm damage? Street, or boulevard, trees have a number of benefits. A significant benefit is that street trees shade paved surfaces, reducing the heat island effect and helping to cool stormwater run-off. Others enjoy the natural screening street trees can provide, as well as, the shade which reduces cooling costs in the summer, not to mention the valuable habitat they also provide. If you are interested in having a tree planted in your boulevard contact us at 563.326.7923 or send us a request. The city plants street/boulevard trees upon request as funding is available, and when the boulevard can support a tree. Report a problem with a street tree by issuing a request for service or calling us at 563.326.7923. To keep your private tree in good health, proper maintenance is necessary. The city does not maintain private trees. Property owners can choose to maintain their private tree on their own, or may contract a tree care provider. Find resources at the tabs below. When it comes to nuisance trees, forestry may cause a private property owner to remediate private tree issues that present hazards in the city right-of-way. Other private tree issues, such as encroaching on an adjacent property, should be discussed with the property owner where the problem originates. Private Trees Overhanging Sidewalks, Streets and Alleys. Tree limbs at a height of less than 8ft above a sidewalk and less than 14ft above a street or alley are hazardous to those who use these right-of-ways to travel within the City. They can present hazards to pedestrians, block off the line of vision for drivers and cause damage to public and private vehicles. Ordinance 8.14.280 states, "It shall be the duty of any property owner bordering on any street upon which property there may be trees or shrubs, to prune such trees or shrubs in such manner that they will not obstruct or shade the street lights, or obstruct the passage of pedestrians or vehicles on such sidewalks or streets, or obstruct vision of traffic signs, or obstruct view of any street intersection." It is important to comply with this ordinance because a tree, or any other woody plant material, encroaching on the City's right-of-way that causes damage to a vehicle not owned by you, you can be held liable for the damages. If you own a tree that overhangs a sidewalk, street or alley, please prune your trees to a height of 8 ft. above the sidewalk and 14 ft. above street and alley right-of-ways. To report a private tree that is under height and overhanging a street, sidewalk or alley contact Public Works at 563.326.7923 or make a request for service. Trees offer timeless beauty through all seasons and provide essential habitat and shelter for many living things. Often we recognize trees for their ability to filter air pollution, but they are often overlooked for the many other benefits they provide. Trees help reduce the impacts of stormwater run-off. The leaves and branches of trees help reduce the erosive energy of falling rain, helping to prevent soil erosion from, and during, rainfall events. Planted along a water body, street or in a parking lot, trees cool water in, or entering, a stream. And just like native plants, trees can help filter pollutants. Trees aren’t just habitat for birds and squirrels, they provide essential habitat for aquatic life too! Trees have economic and social value, not to mention, can reduce our consumption of energy resources. The shade of trees can significantly reduce the “Heat Island Effect” and summer cooling costs. 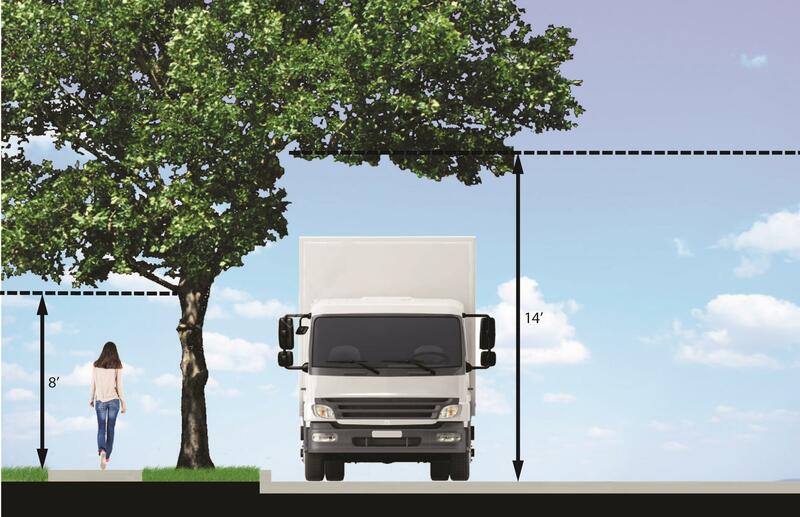 Did you know the air temperature under the shade of a tree can be as much as 15 degrees cooler and surface temperatures such as pavement can be 40 degrees cooler? Trees increase curb appeal. Perspective buyers are often willing to pay more for properties in treed neighborhoods and for homes with trees. Check out this study conducted by the EPA http://www.epa.gov/heatisland/mitigation/trees.htm. What is EAB, or the Emerald Ash Borer? 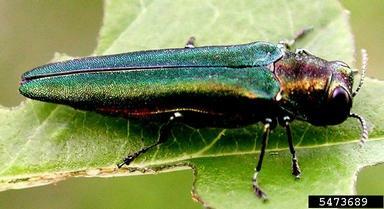 The Emerald Ash Borer is a very small shiny green beetle about 1/2" long by 1/8" wide. This invasive insect feeds on the cambium tissue of ash (Fraxinus) trees. Once infested the tree begins to decline after 2 years and will be dead in the next 4 years. Once the tree is dead it becomes hazardous due to a threat of falling limbs and trunk. The Emerald Ash Borer originates from central Asia, in countries such as Russia, China, and Mongolia. It is believed the insect was brought to this country in wood packaging material. It was first discovered in Detroit, MI in 2002 but is believed to have been here since the mid 1990's. Since its discovery in 2002, it has spread to 24 states and 2 Canadian provinces. The insect is believed to have been predominantly transported by the movement of firewood. Knowing the insects pattern, the City activated its EAB response plan five years ago when EAB infestation was identified just 80 miles from Davenport in LaSalle, IL. 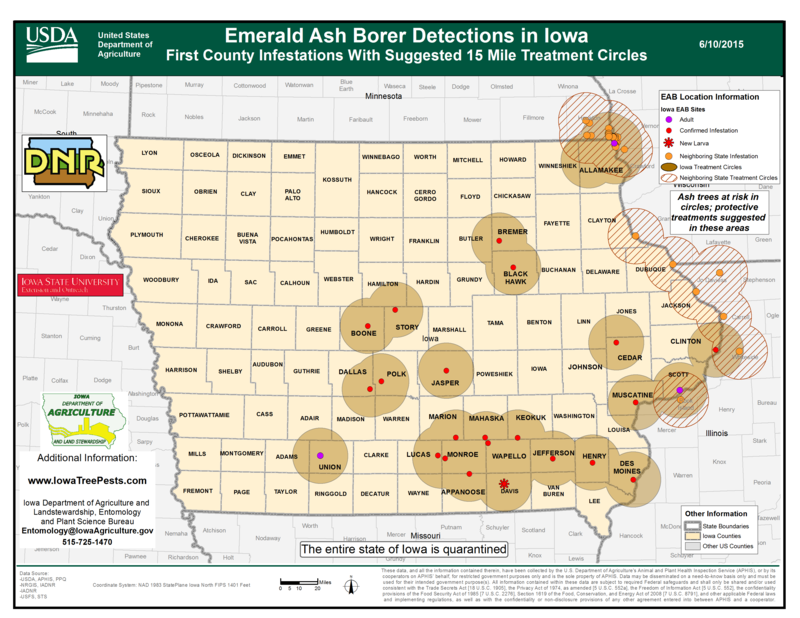 During that five year period identification of EAB infestation came closer and closer to Davenport, with identification in Cedar County in 2013 and Muscatine and Rock Island (IL) counties in 2014. EAB was identified in Davenport in the Spring of 2015. The city continually monitors presence of the pest. The ash tree removal process has started. Initial steps to reduce infestation included targeted removal of public ash trees in the worst condition, followed by removal of groups of ash trees in close proximity to each other. Reducing the impact of ash tree removal (loss of tree canopy) by implementing an aggressive tree planting program. Nearly 2,200 trees have been planted in the city right-of-way in the past five years. The City is not preserving public ash trees with EAB treatments due to the expense and benefit of treatment. Citizens interested in preserving city trees in the boulevard adjacent to their home, may treat these trees at their own expense. Citizens wishing to treat trees should apply for a permit to treat the city-owned tree(s). This allows the city to track what trees are receiving treatment, the chemical used, who treated the tree, and when it was treated. The permit also ensures the tree will not be cut down by forestry crews. Listing of contractors permitted to treat public ash trees in the city. For private trees, the city recommends citizens first determine if they have an ash tree on their property and then decide whether to treat the tree for the remainder of its life or to remove it. The city's arborist recommends contacting an ISA Certified Arborist for help determining a course of action. Citizens who decide to remove their tree will need to abide by the quarantines set by the Iowa DNR and USDA's Animal and Plant Health Inspection Service (APHIS). When removed, citizens are encouraged to take their wood waste to the City's Compost Facility. Wood waste is accepted at no charge. Find answers to Frequently Asked Questions produced by Iowa State Extension and Outreach at this link. Don't Move Firewood. Moving firewood poses the greatest threat of spreading EAB further.